Not to be confused with Koprivnica, a town in Croatia. Kopřivnice (Czech pronunciation: [ˈkopr̝̊ɪvɲɪtsɛ]; German: Nesselsdorf [ˈnɛsəlsdɔɐ̯f], Polish: Koprzywnica [kɔˈpʂɨvɲit͡sa]) is a town in the Moravian-Silesian Region of the Czech Republic. 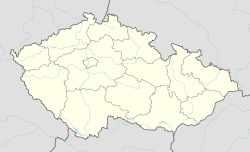 Until 1918, NESSELSDORF - KOPŘIVNICE was part of the Austrian monarchy (Austria side after the compromise of 1867), in the Nový Jičín - Neutitschein district, one of the 34 administrative districts (Bezirkshauptmannschaften) in Moravia. A post-office was opened in 1870, named Nesselsdorf. In 1850, both of the former villages, Drnholec nad Lubinou and Větřkovice, became a part of the political district of Nový Jičín within the judicial district Příbor. Between the years 1939-1945, both villages were attached to the Third Reich within so called “the Nový Jičín Landrat”. In 1945 the German population was expelled according to the Benes Decrees. In 1980, Lubina covered an area of 781 hectares. In that year Lubina had a population of 1358 which increased to 1371 in 1991. The number of dwellings increased from 344 (in 1980) to 363 (in 1991).In 1971, Lubina became a seat of a collective farm „Družba“ which was established by uniting of collective farms Lubina, Mniší, Vlčovice and Hájov. The collective farm „Družba“stretched on an area of 1502 hectares. Lubina is a former village situated between Kopřivnice and Příbor. It lies by the north-west border of the former Nový Jičín district in the Moravian-Silesian region. In 1959, two villages, Drnholec nad Lubinou and Větřkovice, were united and formed the old village of Lubina. Later, in 1978, Lubina became a part of the town Kopřivnice. Kopřivnice and the Moravian-Silesian region have a strong industrial heritage: steel, engineering, and automotive industries are strong. The Tatra truck company is based here. During the communist era Tatra employed over 16,000 (including about 1,000 of Vietnamese nationality). It currently employs 3,700. The controlling interest of Tatra was owned by an international consortium of Vectra Group of U.K., Sam Eyde of Lansing, Michigan, KBC PE of Belgium and Ronald Adams, and nowadays, it is owned by Jaroslav Strnad, who is a Czech armorer. Other important industrial sectors include chemicals, pharmaceuticals, glass, rubber, paper and textiles. Brewing is also an important industry and some of the country's finest beers are produced in the area. Meanwhile in the past Tatra was bankrupt, at present, it is increasing its production. New owners haven't only returned it back to the markets, which it had abandoned, but it had also expanded its export through the world including Australia. History exhibit in Muzeum fojtství (Museum of the reeve house). Art exhibit in Šustalova vila (Šustal Villa). Technical museum of Tatra with famous rail motor coach Slovenská strela on display and with a special permanent exhibit on Dana and Emil Zátopek in addition to historical automobiles and trucks produced in Kopřivnice. See also: Category:People from Kopřivnice. ^ "Týden". 31 October 2016. Wikimedia Commons has media related to Kopřivnice. This page was last edited on 7 November 2018, at 10:14 (UTC).